@TBLightning Play-Off Hockey at the St. Pete Times Forum!!! 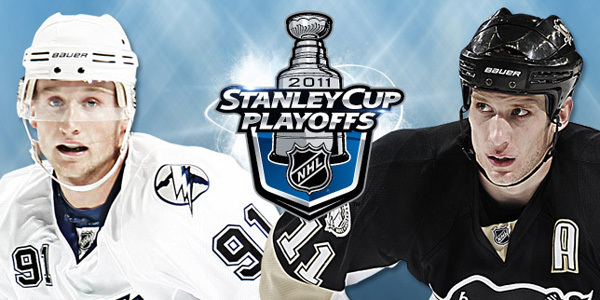 Hockey fans this is what we hope for all season, PLAYOFFS!!!!!!!!!!!!!!!!!!!!!!!!!! I LOVE Hockey, so to me this is like Christmas! Lisa here to update you on what&apos;s going on with the Playoffs. Have I mentioned we made it to the Playoffs? Well we did! Oh, and it&apos;s the first time we have since the 06-07 season! So lets talk facts. We play the Pittsburgh Penguins in the first round. For those who don&apos;t know there are potentially 7 games per series, and the winner has to win 4 games to move on to the next round (similar to baseball). We will play our first two games on their turf, and game one is tomorrow at 7pm. Game two is Friday at 7pm, and then the series moves to our very own St. Pete Times Forum on Monday April 18th (18 is my number, coincidence? I doubt it) at 7:30. Followed by game four on Wednesday at 7pm. Got that? No? Well what&apos;s important is that Our Tampa Bay Lightning will be here on Monday the 18th and Wednesday the 20th. So get your tickets now! I am sure they won&apos;t be around long. There are individual tickets and group tickets available. One really cool thing the Tampa Bay Lightning do is the annual playoff Beard-A-Thon. You grow a beard, post pictures through their website, get sponsors and raise money for the Lightning Foundation. I went online and checked out some of the action, and it&apos;s pretty awesome, and what a great way to raise money for such a neat cause. The Lightning Foundations goal is simply to make Tampa Bay a better place to work and live. So get out there Lightning fans and support your team! I know I&apos;ll be out there cheering them on! Let&apos;s go Lightning!!!!!! That&apos;s all for now, but check back later for other Tampa Bay Area Events, and more Things To Do In Tampa Bay!